Keestrack's R3e track-mounted impact crusher. 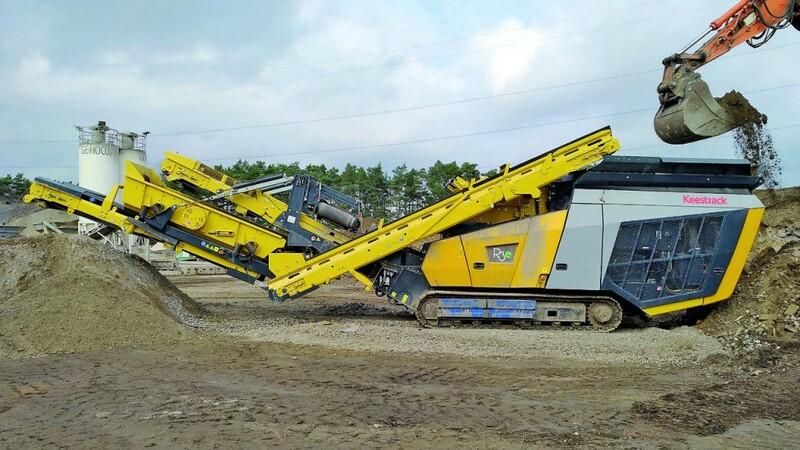 As a highly mobile solution with a broad range of applications from short-term construction site operations to flexible semi-stationary production in medium-sized recycling and production companies, the Keestrack R3 (formerly Destroyer 1011) has been available for many years. The new generation features a modern design. These plants are characterized by fast loading, short setup times on site and a high level of mobility thanks to the supportless frame construction with the rugged undercarriage track frame. Extensive coverings and wide-opening doors and flaps set the standard for accessibility to all operational components and satisfy the requirements for operational reliability and maintenance. From the spring of 2018, the new crusher will be available in a diesel-hydraulic R3 version and as a fully hybrid Keestrack R3e with a diesel-electric drive and fully electric plug-in power supply. At the heart of both versions is the high-performance impact crusher 48 ICR 100-00 with a large 770- x 960-mm inlet opening, and which has an excellent crushing efficiency up to 250 tph thanks to the heavy-duty 920-mm rotor (diameter: 1,100 mm, 3,200 kg) and high rotor speeds. Specially adapted crushing tools, a wide adjustment range for both impact aprons (milling beam is optional) and a sophisticated overload system safeguard a broad range of applications from concrete recycling with intensive wear to the production of high-quality natural stone grains. Thanks to the 235-kW EU IV Volvo diesel engine (option: EU IIIA; 260 kW) and 300 kVA generator as the on-board energy source, the new Keestrack R3e also remains fully autonomous and highly flexible when deployed interchangeably to construction sites. The crusher is powered either by 132-kW or 160-kW electric motors, the exchangeable belt pulleys (375 mm/450 mm) can be used to adjust the crusher's performance characteristics. A 45-kW electric motor with two connected load-sensing pumps provides power to all hydraulic components (drive, crusher control, hub hydraulics, feeder/post screening unit, cooling fans). Through the large use of electric drives in all conveyor systems and peripheral units, extensive hydraulic piping, among other things, is a thing of the past. New cyclone extraction technology reduces the required volume of hydraulic oil in the system for identical change intervals to a mere 75 litres, thereby decreasing maintenance costs and operating costs decisively. The R3e has an external 63 A plug-out connection for the economic operation of subsequently connected screening units or stockpile conveyors as well as a standard plug-in connector for fully electric operation from the mains or an additional generator. All the system functions controlled via the PLC controller with the new intuitive user console and comprehensive remote control unit remain active without the use of the on-board diesel engine. The new optional single-deck afterscreening unit offers almost 4.4 square metres, corresponding to around 30 percent more screening area than the previous model, thereby considerably optimizing machine performance in the production of high-grade final grains. A recirculation conveyor and optional light-material air separator facilitates production in closed cycle, oversize grains can be optionally removed as a secondary product via a removable discharge side-conveyor. All other conveyors, including the optional fines discharge in the pre-screening unit, can be hydraulically folded for transport purposes (transport dimensions (l/w/h): 12,900 x 2540 x 3200 mm). Even when fully equipped (including milling beam), the fully hybrid R3e only has a transport weight of around 32.0 t – barely 1,000 kg higher than the conventional diesel-hydraulic version. Keestrack predicts immediate savings in energy costs of between 40 and 70 percent compared to conventional diesel-hydraulic drives for its diesel-electric crushing machines or fully hybrid solutions with optional plug-in power supply. Other advantages include lower maintenance costs primarily for electrical conveyor systems and screening modules and an overall higher service life for drive components that are more uniformly loaded. Over the past two years, the manufacturer has introduced the impact crusher units Keestrack R5e and R6e, jaw crushers B3e and B4e and cone crushers H4e and H6e, each of which are fully developed crushing solutions for partially electric or fully hybrid deployment in all relevant applications and power classes of mobile recycling and mineral production.